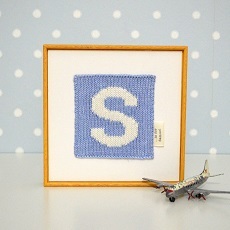 Bold knitted initial personalised with your chosen name in a handmade wooden frame. Add the finishing touch to a nursery or child’s bedroom with these personalised framed initials. All created with a ribbon tag attached to the initial featuring “…is for [your child’s name]” printed in a vintage typewriter font. Framed in glass free frames that have been handmade in Northamptonshire by a local family business. The personalised frames look great on bookshelves, dressers or mantel pieces as they stand alone, or can be hung flush to the wall. These lovely decorative letters are available in grey, pink and blue. Smitten personalised initials are knitted in Sirdar’s Baby Bamboo yarn (80% Bamboo 20% Wool) and mounted onto antique white textured artboard. The wooden frames are lightly wood stained for a natural finish.